My former company Ubisense (which I still hold some equity in) is going to have its indoor location tracking technology featured at the upcoming Location Intelligence conference. I'm looking forward to seeing the latest iteration of the technology, which has come along significantly since I left there in late 2005 to join Intergraph. The technology will feature heavily in the opening "speed networking session", and all conference attendees will be given tags which will track their location throughout the conference. Ubisense uses ultrawideband networking, which is generally accurate to within a foot or so (though that depends on a variety of factors). When I worked in this space, I was really surprised to find out how hard it was to do accurate tracking indoors. The difficulty is that whatever type of sensing technology you use, signals tend to reflect off walls, floors and ceilings, and direct signals are frequently blocked by furniture, people or other obstacles. This means it is very easy to get false readings which can result in serious errors in location calculation. There are a variety of technologies that people are using to try to tackle the problem. Passive RFID really just measures when a tag is within a given distance of a sensor, so it can be used to track whether someone has entered or left a given room or area of a building, but can't give a more precise location (unless you have a very dense set of readers). WiFi is another option which has a pretty coarse accuracy - typically tens of feet, so not enough to reliably identify which room someone is in, and certainly not accurate enough to measure more specific interactions between people. As I mentioned above, ultrawideband is generally accurate to within a foot or so, which puts it at the higher end of the range in terms of accuracy, with relatively low infrastructure needs compared to other high accuracy solutions like ultrasonic or laser sensors. For several years now I have been thinking that the precision indoor location tracking market is about to take off, and it hasn't quite done so. But based on some of the signs I am hearing about from my friends at Ubisense, I think it may finally be reaching that point. I will write more about how it all works out at the show next week, and also plan a few more updates on what Ubisense is up to. I seem to have had an unusually high number of "looking for ..." posts recently, but I was chatting with a local startup who is looking for someone with good FME skills in the Denver / Boulder area. Probably initially for a short contract assignment (asap) but with potential to become a longer term contract or permanent position. Let me know if you are interested or can recommend anyone! Stefan Geens of Ogle Earth has written a very thorough review of whereyougonnabe, and has some nice things to say, as well as some good suggestions - thanks Stefan! He compares us to Dopplr, who are really the closest site out there to what we do, and says "Dopplr is simpler to use, while whereyougonnabe is more full-featured". He thought that the "pièce de resistance" was the Google Earth interface and in his summary, he says "in sum, I very much like whereyougonnabe". To be honest, I'm delighted that Stefan thinks we are already more full-featured than Dopplr when we're still at such an early stage of beta release, and they have been out for some time, and have - rightly - been getting a lot of interest and good reviews. And I would agree with him that Dopplr is easier to use today than we are. Part of this is that they are doing something much simpler than we are, though similar in some respects (I will discuss this in more detail in a future post), but nevertheless we know we want to make things simpler to use and we have a lot of things in our short term plan which will help on that front. But as I said in an earlier post, while there are lots of things on our to do list, it would have been easy to keep improving things for another several months before releasing, but I felt we were far enough along to get something out there and start to build up some users and get some feedback. And while we still have a few more rough edges than I would like, I think the response so far has been very good and I'm glad we did decide to get it out there rather than waiting longer. And lastly, one small point of clarification / correction ... Stefan suggests it would be nice to have color coding to show "close encounters", and actually we do have that in there already ... I suspect he may not have any close encounters yet so the color coding has not shown up. But a green box around a friend's picture shows that you are "very close" and a yellow box shows that you are "somewhat close". What constitutes "very close" and "somewhat close" varies depending on a number of factors, including how far from home both you and your friend are (in general, if either you or your friend are far away from home, a larger distance is used than if you are close to home). The ability to have a variable distance for determining what constitutes a close encounter is something that Dopplr's approach does not handle incidentally, and I think that this will be a powerful enabler for us as we add more sophisticated features to the application (though not something that the user is necessarily conscious of). So anyway, thanks again to Stefan for the detailed review. It's been an exciting week, with getting the system out to the world, and by and large everything went very well ... on to working through the big enhancement list now :) !! They're trying to come up with a short list so I thought I'd see if anyone out there has suggestions for companies they might consider, so I can try to give them as thorough a response as I can. You can post a comment below or email me at peter@ebatty.com. Thanks! Why not just talk to your friends? Well, we have a few of the Luddites out in the comments on James' blog - there's Andy "whatever happened to talking to your friends" and Bubba "Facebook is inherently evil and a waste of time" (incidentally, Ned Ludd is from Anstey, the village in England where I went to High School, in case you were wondering - though according to Wikipedia there is no proof he actually existed, which I hadn't heard before). But I digress! While I fairly obviously disagree with most of their comments, there are elements of sentiment in there that I do agree with, and they raise some topics which are worth a discussion in terms of how we communicate with people, and how communication mechanisms have evolved. First I should say that obviously a primary aim of whereyougonnabe is to help you meet your friends more often in the real world - I certainly agree with the principle that you can spend far too much of your life sitting in front of a computer, and in front of Facebook in particular. But electronic communications obviously have a strong role in being "social" and maintaining your relationships with friends - as someone with friends all round the world and most of my family 5000 miles away in the UK, email enables me to keep in touch with them much better than I could without it. That's not a substitute for meeting face to face of course, and that's part of the motivation for whereyougonnabe. With the rise of social networking systems recently we have really seen an evolution from one to one communication to many to many communication among friends. It's interesting if you use Facebook (which I assume Andy and Bubba don't) to see how a sequence of short and often trivial status messages can give you a good feel for what distant (or local) friends are up to, and every so often prompt you to get in touch with them in response to something you see - much more than you do without that impetus, in my experience. Twitter is the same type of experience. As I've heard Mark Zuckerberg say (paraphrasing), the cost (or effort) of communicating with your friends is significantly lowered by systems like Facebook. Just by taking a few seconds to type in a short message, you can communicate with hundreds of friends wherever they are in the world. I certainly feel more connected with my distant friends who are on Facebook (in general) than those who are not. Now there's a lot of crap on Facebook too (I can do without vampire biting applications personally) and yes, a lot of people waste a lot of time on it, but you can say the same of the web in general, or television, or whatever. But that doesn't change the fact that it does represent a new paradigm in how you can communicate with your friends. However, one of the challenges with this type of many-to-many communication is that if it becomes too successful, then ironically it can lose its effectiveness. Once you get hundreds of friends using Facebook or Twitter or something similar and they all start posting messages frequently, you reach a point where you just can't keep up with the volume of messages (unless you really don't have a life, in which case Bubba may have a point). So you need some way of filtering that stream of messages down to a manageable volume, trying to select the messages that are most interesting or relevant to you. Facebook claims to do some clever filtering in determining which stories to display in your Newsfeed, but they don't have too much information to go on, and it's not clear to me that they really pull out messages that are most interesting to me. One of the things that we are doing with whereyougonnabe is to add extra information to certain messages you want to communicate to your friends - specifically location and time - which gives us a much greater ability to extract items of specific interest to you from this big message stream. We do this primarily by choosing messages where you will be close to your friend in space and time, to help you meet your friends in the real world more often than you would do otherwise (back to having a real life :). If that approach doesn't yield enough messages to display, we can display other messages using either random selection, other approaches like those Facebook uses, or by leveraging location again to pull out messages which seem like they may be more interesting - for example, if someone is far from home that is probably an unusual situation and may well be of more interest than one close to home (in general). Changing direction a little, let's look at a couple of specific examples of how whereyougonnabe can help you meet your friends more often, in a way that really can't be achieved just by "talking to your friends" (or phoning them or emailing them). The first is meeting people in airports. When I worked at Intergraph and was traveling frequently (more or less every week), I would randomly run into someone I knew at Denver airport about once a month. When you consider the huge size of Denver airport, this leads me to conclude that there is a high probability that there are one or more people I know in Denver airport every time I'm there, I just don't know that they're there. Now hanging around in airports is pretty boring. Sure, I can read or work and that's fine, but if I had a chance to spend all those spare half hours between getting through security and boarding the plane by meeting up with friends who I wouldn't otherwise have seen, that would add a lot of value and enjoyment to my life. And whereyougonnabe can give me the information to let me do that. It's really not a practical proposition for me to call the hundreds of friends who are candidates for being in Denver airport before every trip to compare notes on schedules. And if I did an email blast to all of them before every trip I would rather quickly become unpopular, and if everyone started doing that then you're back to the information overload problem. With whereyougonnabe I can just take 30 seconds to enter details on my planned time at the airport and it won't bother anyone else with that information unless it's specifically relevant to them or they ask to see it. And once we have calendar integration working, which will be coming soon, then it's zero extra time on my side, since I have to enter the information into my calendar anyway. I was also going to discuss the example of very local interactions - like the one I include in the intro video about going to the supermarket - but this post has got way too long already so I think I'll save that for another day. This example is an interesting one as several people who like the general concept of whereyougonnabe have said that they see themselves using it more for long distance trips than local activities. I can certainly understand that as an initial reaction but, having thought about it a lot, I feel there is a lot of potential in both scenarios. But I'll come back to that. Anyway, I'd like to summarize a couple of things before signing off. I think there are (at least) two rather different ways to look at what whereyougonnabe does. The first is that it's an application specifically focused on helping you meet up with your friends. That's how I started out thinking about it, and still that's certainly a major focus and primary benefit of the system. However, you can also think of it as an evolution of many-to-many friend communication systems, like the Facebook messaging system or Twitter. You get many of the same benefits, of seeing what your friends are up to in a general stream of short messages, but with the added benefit that we can highlight (notify you about) items of specific interest, in particular in regard to opportunities to meet with friends. This becomes increasingly valuable as the system becomes more heavily used, and it becomes hard to keep up with the full unfiltered message stream. If you look at the system only from the first perspective, then as one person said to me, you only get a "reward" from the system when it identifies an opportunity for you to meet someone, which may not happen very often, especially when you are new to the system and don't have many friends on it. But if you look at it from the second perspective, you get "rewards" from the system just through finding out what your friends are up to, in the same way that you do from a Facebook or Twitter, and with the added bonus of being able to see things on a dynamic map which gives you a whole new dimension compared to a simple text stream. And last but not least, while I disagree with my friends Andy, Bubba and Ned in one sense, and believe that there is significant value in social networking systems, I agree with them that you can spend too much time using such systems, and a key aim of whereyougonnabe is to enable us to spend more time with our friends in the real world. Well, overall our first day with whereyougonnabe went well. A couple of hundred people from 20 countries have signed up so far, we've had a good amount of positive feedback, and the system seems to have been running well. Personally I have already discovered quite a few interesting interactions with friends I didn't know about before, which bodes well for the system being useful. We got some coverage in the blogosphere from James, Glenn (who will be close to me next week) and Jonathan (who had some constructive feedback and liked the Google Earth integration). As Jonathan commented, the effectiveness of it is very much dependent on the "network effect" - the more friends you have using it, the more useful it is. This is one of the key reasons we built it on top of Facebook (initially) rather than doing yet another independent networking system. I personally am pretty reluctant to invite friends to a new online networking system until I'm really convinced it's valuable - but of course it's not really valuable to you until you have a lot of friends on there, which is a big barrier to success for a new system. We had a few issues with browser compatibility which we hadn't uncovered in our alpha testing, but which got quickly exposed with a larger group of users. We currently don't support Safari but we're working on that (we knew about this before but it turned out that our nice error trapping worked in the main application but not on the initial sign up page, so apologies to the Safari users who experienced ungraceful crashes trying to sign up - this will be fixed tonight). We've also discovered some issues with IE6 which we hadn't come across before, and we're debating whether to try to support that or whether to follow the "Save the Developers" campaign! We now have a whereyougonnabe forum up, so please use that to let us know about any problems or to post suggestions for future enhancements. Thanks to everyone for all their interest and words of encouragement! Our whereyougonnabe application is now open to the world! Introduction to whereyougonnabe from Peter Batty on Vimeo. The key idea of the system is that you and your friends tell us where and when you will be doing things in the future, and we look at this information to tell you when you will be close by to your friends. Even if you end up not being close to your friends, we give you various ways to see what they are doing, which is a good way of keeping up with them in a similar way to Facebook status messages or Twitter, but in a richer fashion which adds both a spatial and temporal element - the ability to display what they are doing on a map, and see what they are doing over time, rather than just right now. This focus on the future is our biggest differentiator - there are lots of systems focused on where you are right now (and we see lots of opportunities for integrating with them, but that's a topic for a future post). Future location has two significant advantages over current location. The first is that if you only find out right now that a friend is close by, the chances are that one or other of you already has commitments and so you can't meet up. But if you knew yesterday or last week that you would be close by, you could have worked out your schedule so that you could meet up. Secondly, "where are you now" applications typically require a location-aware phone, and these still don't have big enough market penetration to really give this type of application the critical mass that it needs to take off. All you need to use our application is a web browser. Of course, the challenge of future location is that you can't infer it automatically, so one of the critical success factors for us is making it very easy to create activities. Currently this is a manual process, which we have tried to make as easy as possible, but this is an area where you will see a lot of new functionality over the next month or two, with much more in the way of calendar integration and functionality to make it much easier to create a trip with multiple activities. We have a precise spatial and temporal resolution, unlike other applications we have seen in this space, which tend to have spatial resolution of a city and temporal resolution of a day. This means we have many local applications as well as more global ones - like identifying which friends will be in an airport at the same time as you, or identifying opportunities to coordinate rides when transporting kids to after school activities, or working out which friends will be in bars close to you this Friday night. whereyougonnabe integration with Google Earth from Peter Batty on Vimeo. Our application currently runs on the Facebook Platform. The big advantage of this is that you don't need to re-enter your network of friends, you can just leverage the existing social graph that you have in Facebook. In future we will support other social and business networking systems - LinkedIn is an obvious target for the business traveler, and of course OpenSocial is on our list too. So anyway, please give the application a try and let us know what you think. Now that we have the beta release out "in the wild" I'll be blogging a lot more about some of the technology behind it and some of the things we plan to do in the future. 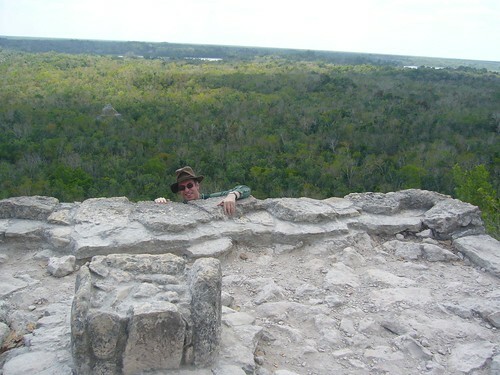 I've been on vacation in Mexico, which was very nice, and very busy for the week or two before that, so trying to catch up now ... but Safe Software has now posted a copy of my slides and a video of my presentation at the FME 2008 User Conference. I'll be blogging about a number of the things I talked about (and have already blogged about some of them, of course) in due course, for those of you who don't want to watch a 45 minute presentation :). There are also videos of Don and Dale's entertaining double act presentations on FME 2008 and FME Server, which were both very interesting.